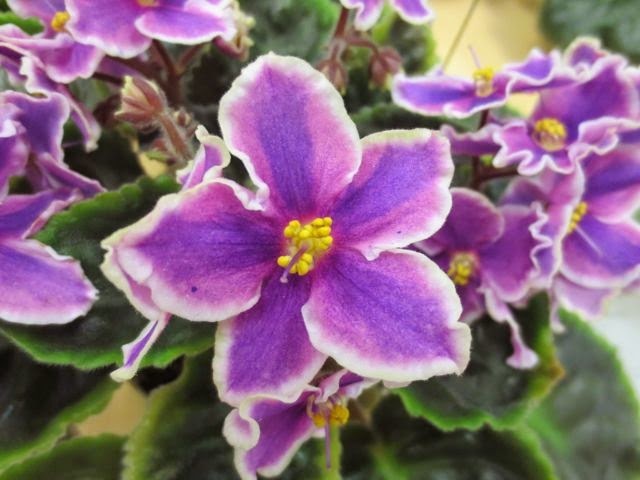 The North Star African Violet Council happily invites you to their AVSA Fall Show at Bachman's Garden Center 6010 Lyndale Ave. MPLS, MN. Saturday Oct. 1, 10:00 AM to 4 PM, and October 2, Noon to 4 PM. 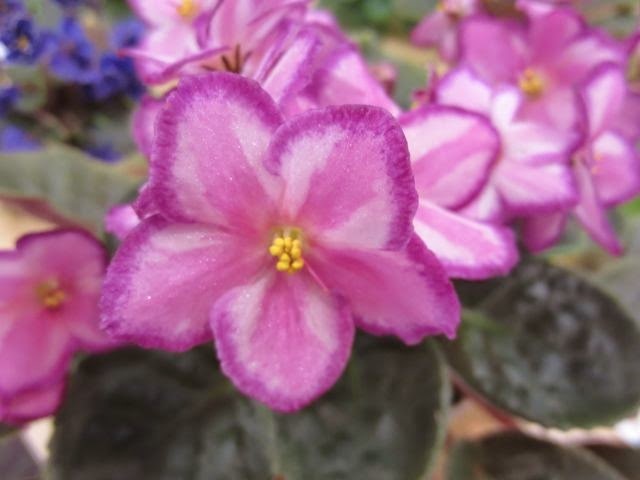 There will be lots of sale plants and lovely violets to see! Come and join us for a great plant weekend! 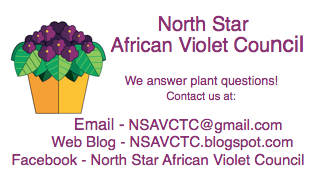 Contact us at NSAVCTC@gmail.com or follow us on Facebook at North Star African Violet Council. I really like this one... the spots are big and bright and the flowers are large! 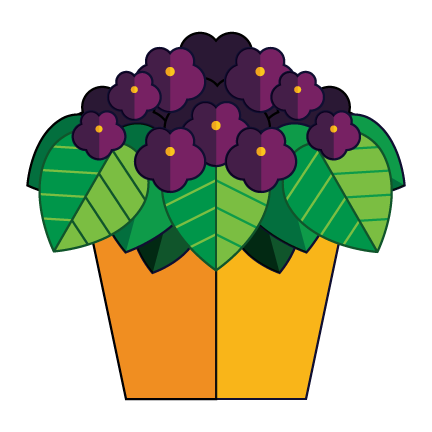 A fun plant to grow and something different from the ones you see at the grocery store! Give this one a try. 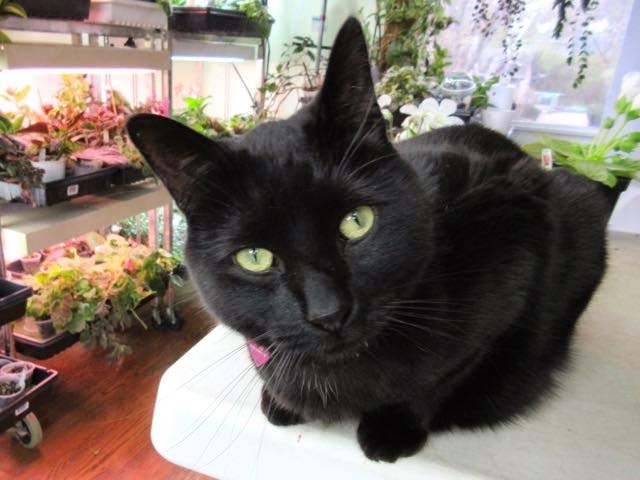 You can find it at Lyndon Lyon's Greenhouses. We are hitting the modern age! 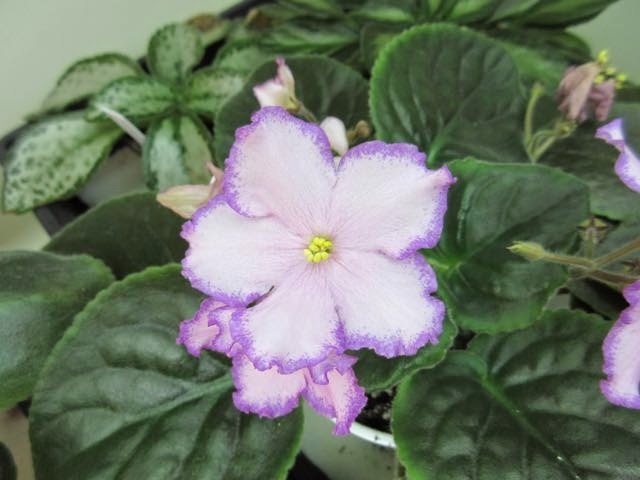 We are now on Twitter NSAVCTC @NSAVCTC and on Face Book at North Star African Violet Council a community page for everyone interested in African violets and other fun things! Come on and join us for some Violet Fun! Sometimes violets will not automatically bow to your wishes and bloom precisely on time for the big show. Here is one thing that might slow down a plant that will be in bloom before you wish it to be. This crafty grower put the plant on the basement floor, which is cooler than on the shelves, and not directly under the lights on the stands. You can see the stands to either side of this shot. Sometimes this will slow the plant down so you will get just the perfect blooms on the days you were hoping for. 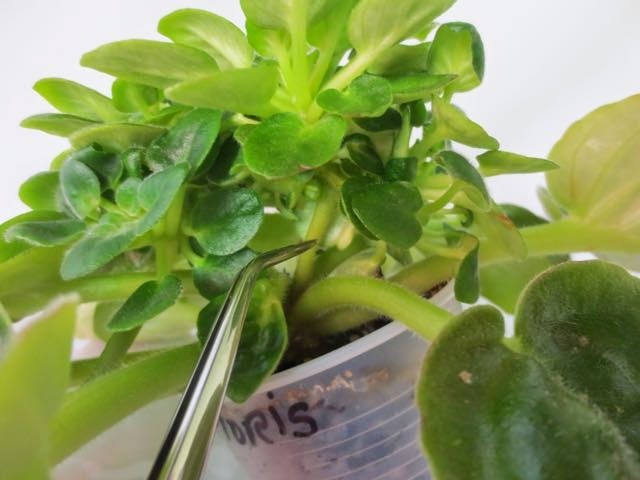 Other growers turn off lights, or severely reduce the number of hours of light the plants are getting, and some even put them in a dark closet for a few days. These ought to brighten up a cold morning! 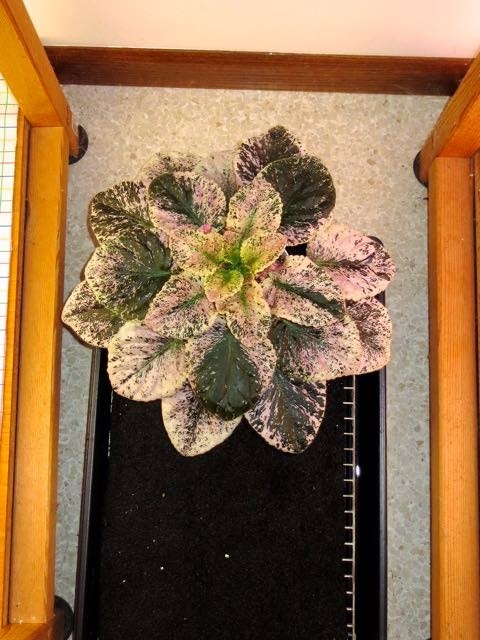 Janice O, sent these photos of some stunningly lovely variegated plants. Both of these are "oldies but goodies" as the saying goes. 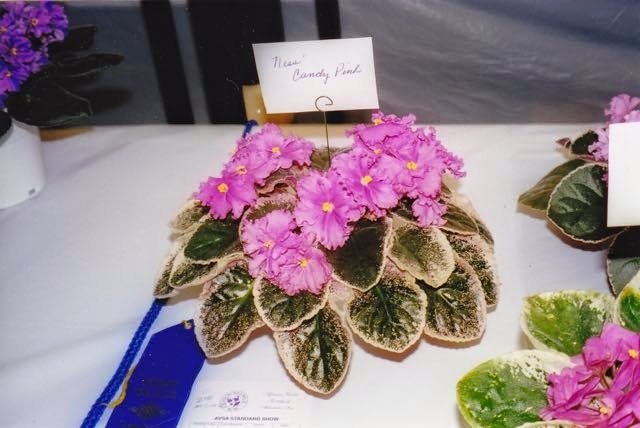 Ness' Candy pink was hybridized by Minnesota hybridizer Don Ness in 1995. 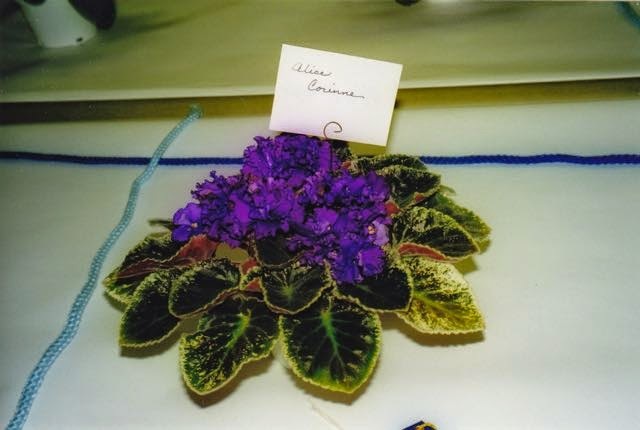 This lovely plant by Delores Harrington, also from Minnesota, was hybridized in 1998. The variegation on each is striking and the flowers are really complementary with the leaf color. 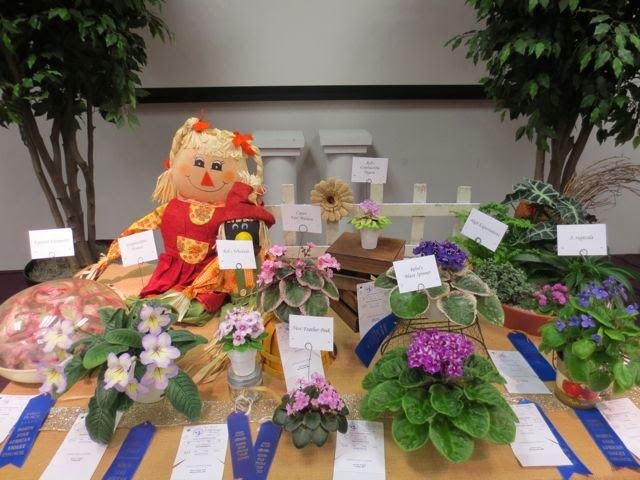 I should mention that Janice grew these for a fall show. It's sometimes hard to get good looking variegated plants over a hot summer and keep the variegation as nice and evenly colored. 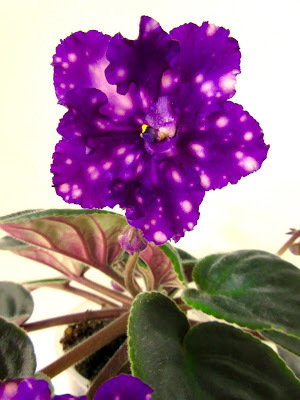 In warm weather, variegated African violets may start growing new leaves that are less variegated or even totally green. Not all variegation is affected by temperature but most seems to be. Once a leaf starts to grow, it will keep the patterning that is on that particular leaf throughout it's little leafy-life. A particular single leaf does not change its appearance. 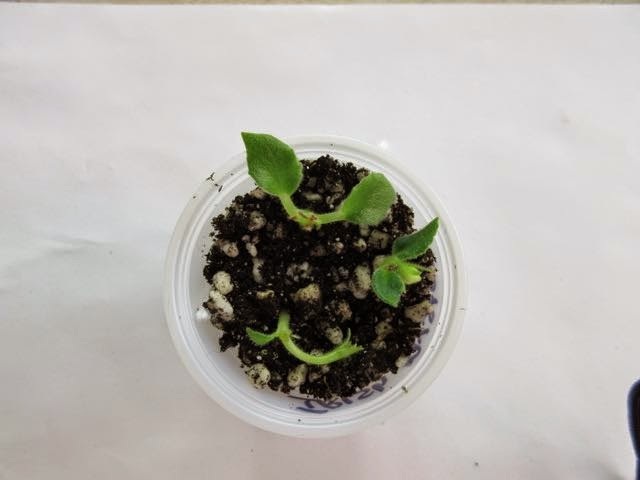 The plant produces leaves and grows (hopefully) continuously and the look and color is reflected in the plant as a whole. 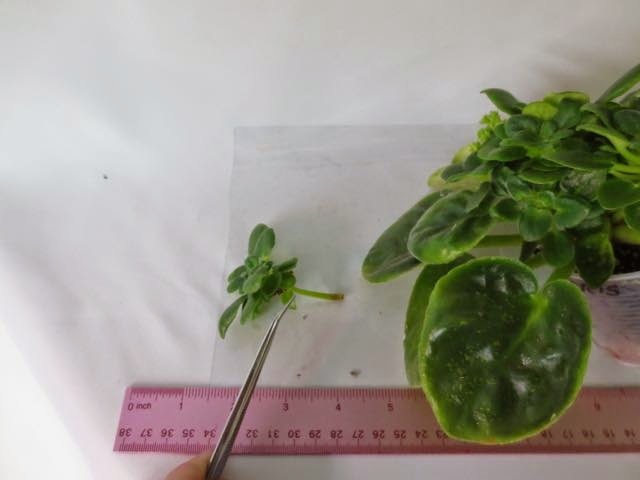 So, variegated varieties of plants that grow in cooler circumstances tend to have coloration that displays the variegation more than ones that are grown in warmer circumstances. 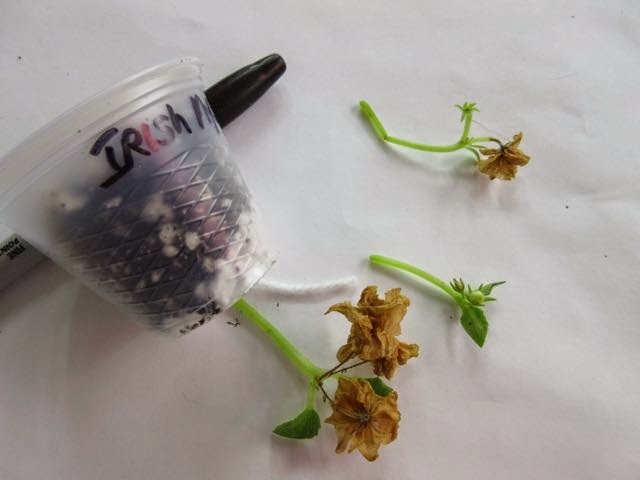 More Bloom Stem Fun, or Genetic Accident in a "Never Floris"
The previous post was about propagating more plants using a bloom stem. This plant's version of trying it out is unique to me, but I found a plant that did the job for itself. 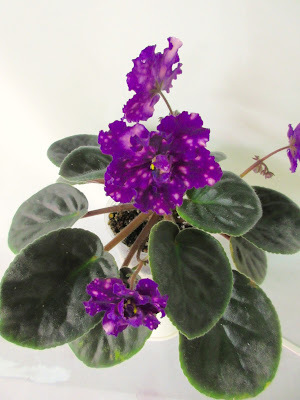 This is a very quirky African violet named 'Never Floris'. It never blooms, the buds form and stay that way permanently. 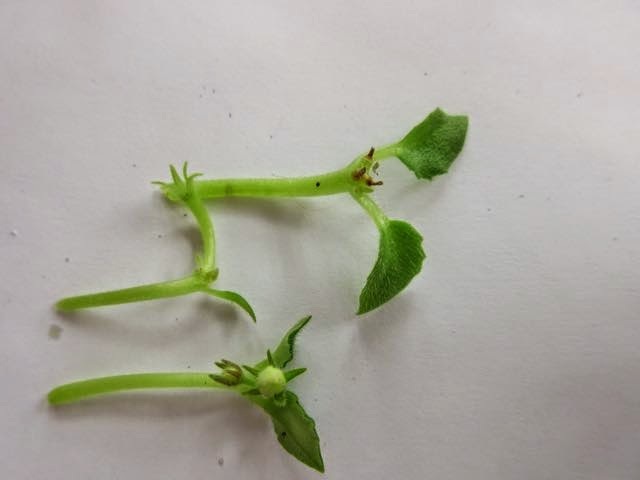 The first picture shows one of these stems which are quite long. The tweezers is pointing it out for you. The buds apparently didn't form but it made it's own "baby" on the top of the bloom stem. I've pulled one off to show you how large this thing really is. 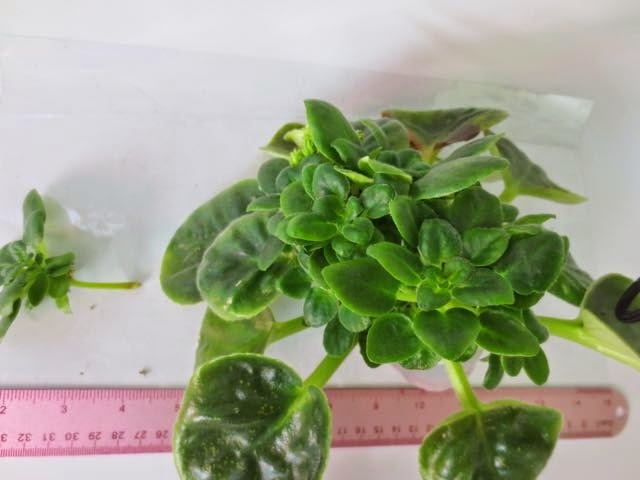 It's a fully formed small plant with an incredibly long stem. This shot from above shows that the main plant has 6 or more of these little plants forming the crown of the plant. 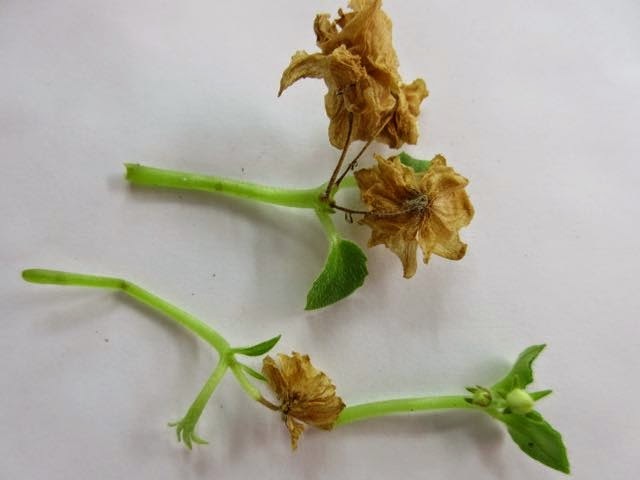 The true "crown" of newly growing leaves was overcome or shaded out and is now dead. This is what is left. Bubble Gum Charm Large, single, creamy light pink stars, shimmer and boast darker pink edges, that are also outlined with darker pink flecks. Flowers stand proudly above the large growing, medium green, tailored foliage. I am a big fan of this particular violet. It's got the greatest color combination and it lays very flat. 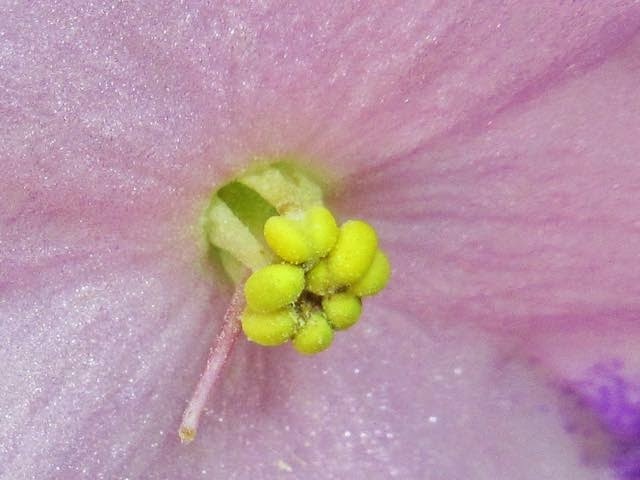 Also notice, the petals are fused until just near the outer edge of the flower, making a saucer shape. Not all violets are like that. Even the flowers have the "hair" on them? This is a fading blossom but pretty anyway. The flowers last a long time and are nicely large. It puts on a good show! I can't help but love that you can see some of the pollen on the exterior of the anthers. 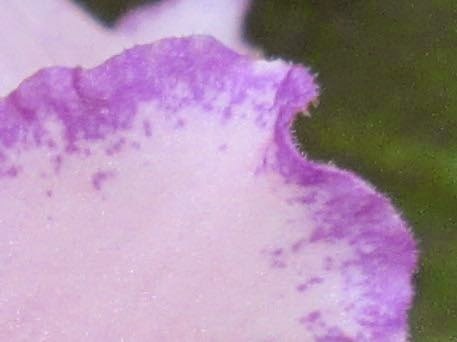 Also you can see some of the "shimmer" or sparkle of the flower. I know you want one! Lyndon Lyons is one of the vendors that carries this variety. Show at Bachman's Tomorrow and Sunday! It's Show Time again! 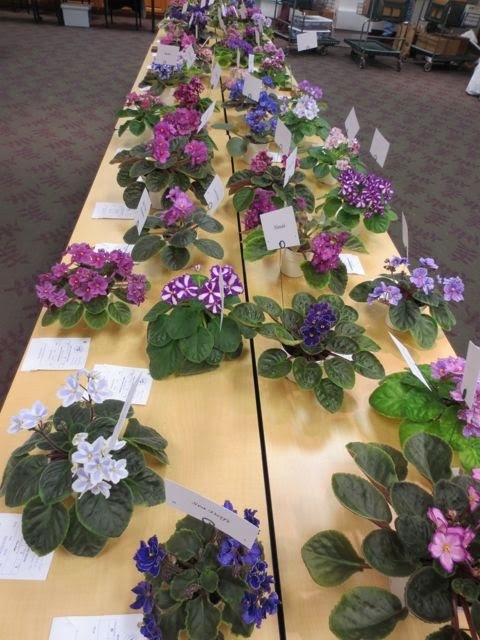 The North Star African Violet Council is having their fall show at Bachman's Garden Center on Lyndale in the Heritage Room! That's in Minneapolis on 60th and Lyndale Ave.
Loooookie loo at the pretty plants! 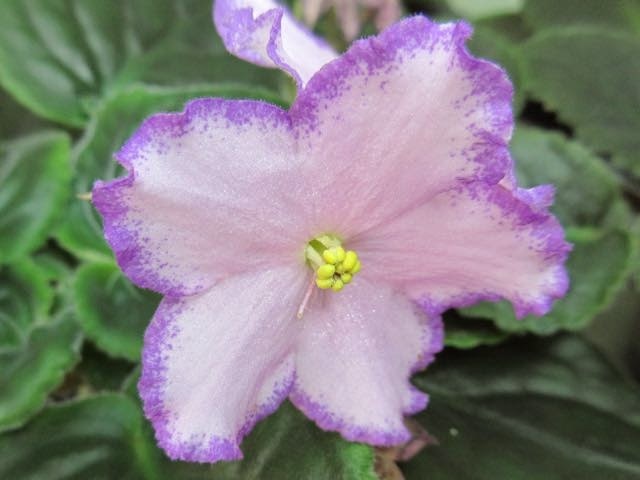 We've got lots of pretty violets to see and for sale. Come on down and visit. The store is also having their Gathering of Friends Antique sale too. Something for everyone! A couple of pretty plants here. This is a chimera and edged. Wow. I must have liked chimeras today. But another pinwheel with an edge. Nice flower for a cold and windy day. 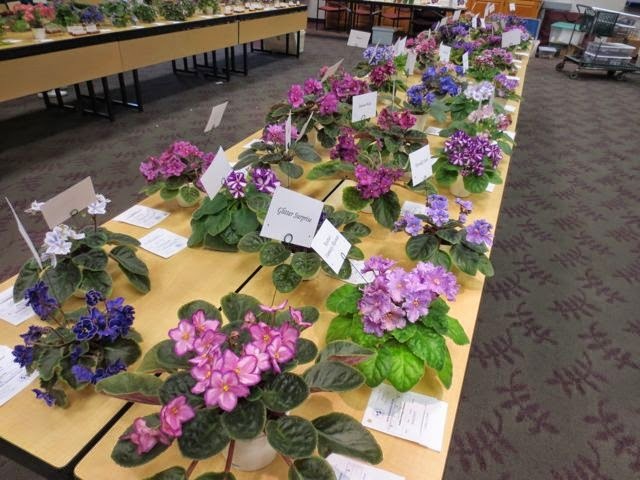 The winner's table with the best plants, designs and gesneriads from the show.